DJing involves far, far more than just playing music. In the hands of professionals like DJ Delights, it is an art form that energizes and entertains your friends and family. And there are practical reasons professional wedding entertainment is priceless. DJ Delights offers the professional pre-planning, the professional lighting options, the professional microphones and cutting edge sound equipment, and the professional photo booths that transform ordinary receptions into extraordinary ones. Even more, isn’t your wedding reception worthy of a legendary party? Yes, it is, and the key is the entertainment. Entertainment makes the event every time. 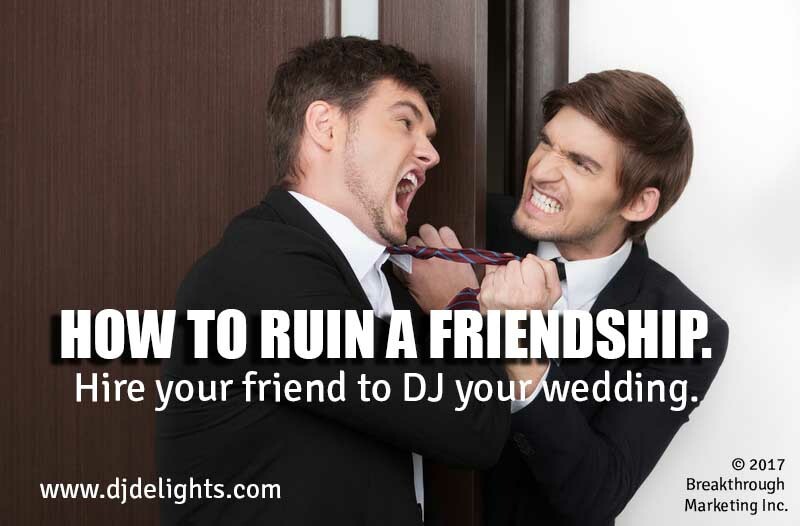 Learn more about how DJ Delights can make your wedding dreams come true, while saving your friendships!